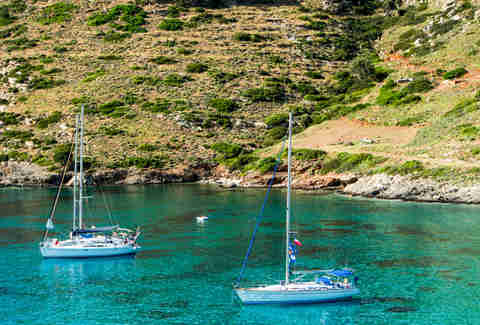 You probably think you know what the Greek islands look like, and to a certain extent you do. The rocky terraces and blinding-white houses with blue shutters, and the grey footpaths with white paint separating each stone. But if your imagination veers from there into the Pinterest-y direction of Santorini and Mykonos, you’re missing out. Islands like that have exploded with Western tourists -- in part because those are the islands with their own airports. The ones without have long been the vacation spots of primarily Greek tourists, and it’s both ironic and of course deeply inevitable that the hordes of American tourists who flock to the more name-brand islands in pursuit of fetishized “authenticity” are overlooking the spots where that exists in its purest form. As the daughter of a Greek immigrant, I grew up visiting my grandmother in Athens most summers, except that upon arrival we would promptly flee Athens in favor of a distant dry rock in the sea. Don’t misunderstand -- the Greek islands are not lush or green or in any way remotely tropical in appearance. They’re arid and dusty and charming, home to small fishing villages and tavernas with the tables wedged unevenly in the sand on the beach. Most have a population of a few thousand for the entire island; in the off-season, maybe a few hundred. You’ll eat octopus, and sea urchins, and fresh fish, and every honey-drenched pastry imaginable. I’ve spent mornings swimming out to a church on a spit of land that I climb up to from the sea, and had tiny silver fish jump from the water and arc back and forth over my head. It’s almost as if they’d never seen a person before, which is more like the sort of adventure you also may be chasing. Kythnos (also spelled Kithnos, depending on the translation) is quiet and lovely, and the particular magic of it is that for an island so very off the grid it’s actually the easiest one to get to. If you’re coming from the port of Piraeus, which you probably are, it’s the first stop on the Cyclades ferry route I can still recite by heart if you get me tipsy. In a way, it’s almost the Aegean equivalent of flyover country -- everyone passes it on their way to somewhere else, and we all see the port town of Merichas every trip but most of us never actually get off there. Head to the town of Loutra for the thermal springs. 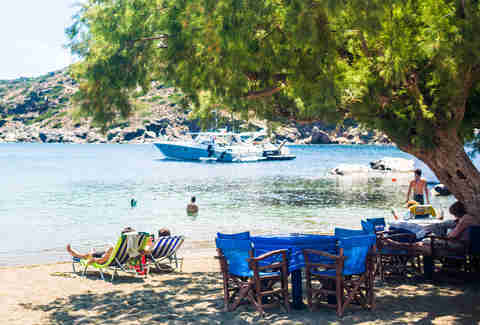 The real move is just to rent a scooter and explore the infinite remote beaches for yourself; much of Kythnos is a time-capsule from the days before Western tourism. It took about seven to nine hours to get here by ferry when I was a kid, but these days the high-speed boats will have you there from Piraeus in probably three. For dinner and drinks -- or lunch and drinks, or ice cream, or pastries -- go to the capital, Apollonia. The beachside tavernas in the port town of Kamares are in the designated location of what would be Unremarkable, Western-Tourist-Only Restaurants in a larger place, but my Greek family and I have eaten a million meals at them without embarrassment -- everything’s good. 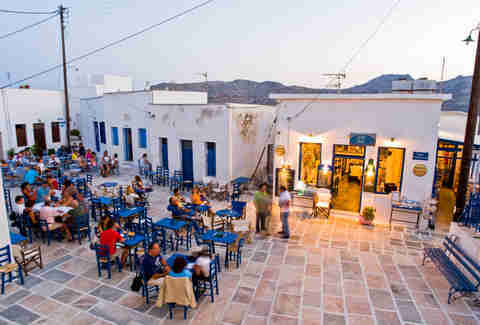 The place I always stayed, and the place that is Sifnos for me, is the town of Faros. I can’t tell you my favorite parts of the village -- I am weak and selfish, so this where I leave you, I’m sorry -- but we’re talking about a very, very tiny place. You’ll find them.